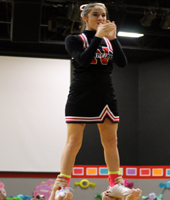 New Covenant Academy runs a Varsity Cheerleading Pep Squad program for girls in grades 9-12. The cheer team plays an integral role in the student body by acting as student ambassadors representing the school at many athletic sporting events and supporting peer efforts at competition. Students participating in this program learn important life skills such as: leadership, trust, and determination. They develop friendships, they learn to work through conflicts and solve them and they really have a lot of fun! 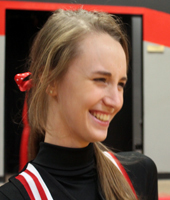 Many New Covenant Academy cheerleaders have gone on to college cheer programs, and have entered careers in which the skills learned during the cheerleading experience has helped them to excel. 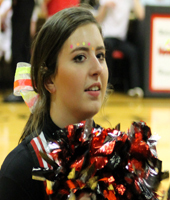 High School Cheer season runs throughout the school year. Practices are held at NCA approximately three to four times a week, depending on whether they are nearing competition season. The cheerleading program follows all MSHSAA guidelines. Students must tryout for a position on the Varsity Pep Squad in the spring prior to the school year starting. Criteria includes strength in executing a cheer, chant, dance and jump which is choreographed by the cheer coach and taught to the candidates prior to tryouts. Judges will assess for strength, skill, spirit, facial expression, team work and will interview candidates to assess their level of commitment and availability to the squad. Students participate in a cheer camp put on by the Universal Cheerleading Association. This camp usually takes place in August prior to school starting. Cheerleaders on the Varsity Pep Squad assist their coach in running one to two cheer clinics a school year for NCA students in grades Jr. Kindergarten through six. This is an excellent opportunity for them to develop leadership skills and be available to mentor younger students. The Varsity Pep Squad earned 1st place in the 2013-2014 school year and 3rd place in the 2014-2015 school year . They also earned an award for the most innovative choreographed routine. 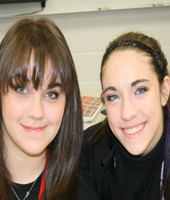 Our girls are expected to work hard together to create a supportive and an exciting atmosphere for our teams. Our goal for the girls is to work hard, show sportsmanship, demonstrate a Christlike attitude on and off the court, and to have fun! Coach Cruz further notes: "cheer is a great way to promote and uphold school spirit. We strive to develop the unification of crowd involvement during athletic events, and encourage a sense of good sportsmanship among all crowds. We want them to have leadership skills that they will take out of the program, that unifies them as a team, with a Christ like attitude on and off the court."